Christopher Lee was born on May 27, 1922 in Belgravia, London, England, UK and his full name is Christopher Frank Carandini Lee. His father (1879-1941), was Lieutenant Colonel Geoffrey Trollope Lee of the 60th King's Royal Rifle Corps. His father fought in the Boer War and the First World War. His father died of double pneumonia on March 12, 1941. His mother, Contessa Estelle Marie and was an Edwardian beauty. She was painted by Sir John Lavery, Oswald Birley and Olive Snell. Clare Frewen Sheridan sculpted her. He has one sister, Xandra Carandini Lee, who was born in 1917. Christopherâ€™s great-grandmother, Marie Carandini was an opera singer, and his great-grandfather was an Italian political refugee. Christopher played his first role as Rumpelstiltskin at Miss Fisher's Academy in Territet after his parents divorced and his mother moved him and his sister to Wengen in Switzerland. His mother later returned to London and married a banker Harcourt George St-Croix Rose. His stepfather is Ian Fleming (author of the James Bond novels) uncle which makes Christopher and Ian step cousins. Christopher attended Wagner's private school in Queen's Gate upon returning to London. He is a singer and English actor who mostly plays villains, Dracula and vampires . He is 6' 5" (1.96 m), and his nickname is Chris. He has acted in over 280 films. He was discriminated at first for wanting to becoming an actor because he was taller than other actors and looked too much like a foreigner. Hammer Films loved him for The Curse of Frankenstein (1957) which lead him to being recognized and accepted in the acting society. He speaks French, German, Italian, Spanish and can communicate with others in Greek, Russian and Swedish. Some of his hobbies are travel, opera and golf. 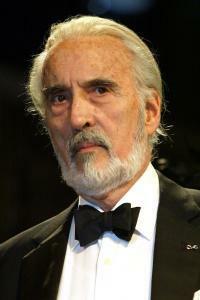 He is best known for playing Count Dracula in Hammer Horror movies, Francisco Scaramanga in James Bond - The Man with the Golden Gun (1974), Saruman in The Lord of the Rings trilogy from 2001â€“2003, The Hobbit trilogy from 2012â€“2014, and Count Dooku in Star Wars prequel trilogy in 2002 and 2005. Christopher thinks his best acting is in Jinnah (1998) as Muhammad Ali Jinnah. He thinks his movie of all time is a British horror movie in 1973, The Wicker Man. Christopher is the only actor who has played Sherlock Holmes andÂ Sherlock Holmes' brother Mycroft. He played King Charles the First of England and King Louis, the Sixteenth of France. He holds the World record for the most sword fights than any other actors in history. Christopher did all of his own stunts and is a member of three Stuntmen's Unions. 1936 -1939 - attended Wellington College and worked as an office clerk in a few of Londons Shipping companies after finishing college. He ranked top at squash, racquets and fencing, and did really good at cricket, rugby, football, and hockey. 1939 - He volunteered to fight for the Finnish Army during the Winter War. 1961 - married Danish model and painter Birgit KrÃ¸ncke (Gitte Lee) on March 17, 1961. She modelled for Balenciaga, Balmain, Chanel and Christian Dior before she married Christopher. 1963 - His daughter Christina Erika Lee was born on November 23, 1963. She was born with severely deformed legs that was bent at an angle that made it almost backwards. Erika wore splints until she was about two years old and eventually learned how to walk without the splints after age three. 2001 - awarded Commander of the Order of the British Empire for his contribution to the films and television industries. 2009 - awarded Knight Bachelor of the Order of the British Empire for his services to drama and charity. 2010 - honoured with "Spirit of Metal" award in the 2010 Metal Hammer Golden God awards ceremony. Title: Tall, Dark and Gruesome: An Autobiography. Title: The Films of Christopher Lee. Publisher: London: Reynolds & Hearn Ltd. Author: Tom Johnson and Mark A. Miller. Title: The Christopher Lee Filmography: All Theatrical Releases, 1948-2003. 1983, May - Starlog (USA), Vol. 6, Iss. 70, pg. 21-24 - By: Ed Naha, "Christopher Lee: He's Lip-Smacking Bad!" 1985, September - Films and Filming (UK), Iss. 372, pg. 29-31 - By: David Del Valle, "Tall, Dark & Gruesome: Interview with Christopher Lee"
1990, July - Fangoria (USA), Iss. 94, pg. 40-43 - By: Bill Warren, "The Curse of Christopher Lee"
1990, September - Starlog (USA), Iss. 158 - By: Bill Warren, "Legends of the Sinister"
1996, March - Fangoria (USA), Iss. 150, pg. 70-74 - By: Bill Warren, "Splendid-Lee"
2001, October 28 - Vimagazino (Greece), Iss. 55, pg. 20-26 - By: Thanassis Lalas, "O Christopher Lee milaei sto Thanassi Lala"
2002 - Scarlet Street (USA), Iss. 44, pg. 49+69 - By: compiled by Richard Valley, "The Many Faces of Christopher Lee: Interviews from the pages of 'Scarlet Street'"
2002 June - Scarlet Street (USA), Iss. 45, pg. 48 - 50 + 73 - By: David Del Valle, "The Return of the Horror King: Christopher Lee"
2002 December - Dreamwatch (UK), Iss. 99, pg. 69 - By: David Bassom, "Dark Knight"
2003, November 23 - The Independent (UK) - By: Christopher Lee, "Christopher Lee: You Ask The Questions"
2005, June - Empire (UK), pg. 97 - By: Steve O'Hagan, "Count Dooku - Christopher Lee"